President Donald Trump delivered his anticipated State of the Union address on Tuesday and as expected, the Democratic Party responded with a fierce rebuttal. 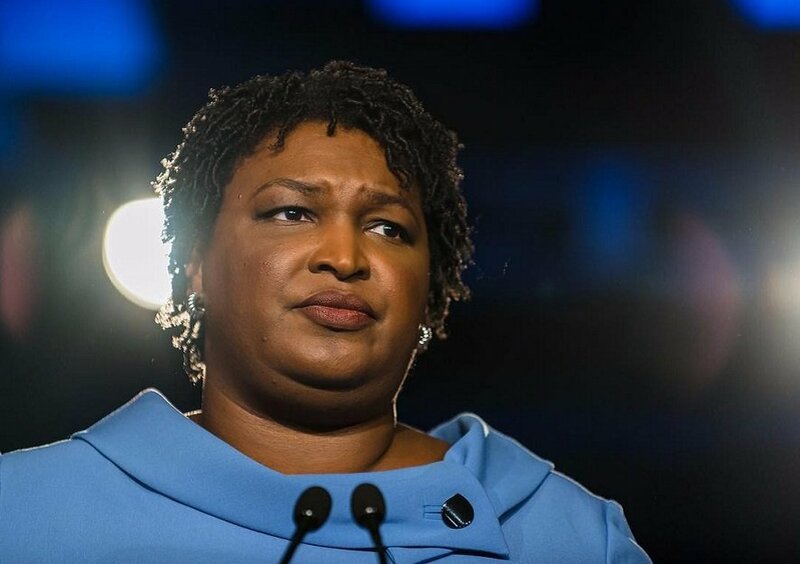 Selected to deliver the response on behalf of the Democrats was Stacey Abrams, the first ever female black nominee for governor in the United States whose campaign to win the gubernatorial seat in Georgia – though she lost – revealed serious voting irregularities in the state. Abrams’ selection was also historic as she became the first black woman to deliver a Democratic response to the State of the Union address. Who is Stacey Abrams and what will her historic election as the first female black governor mean? “Good evening my fellow Americans and happy Lunar New Year. I’m Stacey Abrams and I’m honored to join the conversation about the state of our union. Growing up, my family went back and forth between lower middle class and working class, yet even when they came home weary and bone tired my parents found a way to show us all who we could be. My librarian mother taught us to love learning. My father, a shipyard worker, put in overtime and extra shifts. And they made sure we volunteered to help others. Later, they both became United Methodist ministers, an expression of the faith that guides us. These were our family values. Faith, service, education, and responsibility. Now, we only had one car, so sometimes my dad had to hitchhike and walk long stretches during the 30 mile trip home from the shipyards. One rainy night, my mom got worried. We piled in the car and went out looking for him, and we eventually found my dad making his way along the road, soaked and shivering in his shirt sleeves. Our power and strength as Americans lives in our hard work and our belief in more. My family understood firsthand that while success is not guaranteed, we live in a nation where opportunity is possible. But we do not succeed alone. In these United States, when times are tough, we can persevere because our friends and neighbors will come for us. Our first responders will come for us. It is this mantra, this uncommon grace of community that has driven me to become an attorney, a small-business owner, a writer, and most recently the Democratic nominee for governor of Georgia. My reason for running was simple. I love our country and its promise of opportunity for all. And I stand here tonight because I hold fast to my father’s credo. Together, we are coming for America. For a better America. Just a few weeks ago, I joined volunteers to distribute meals to furloughed federal workers. They waited in line for a box of food and a sliver of hope since they hadn’t received paychecks in weeks. Making livelihoods of our federal workers a pawn for political games is a disgrace. The shutdown was a stunt, engineered by the president of the United States, one that defied every tenant of fairness and abandoned not just our people, but our values. For seven years, I led the Democratic Party in the Georgia House of Representatives. I didn’t always agree with the Republican speaker or governor, but I understood that our constituents didn’t care about our political parties. They cared about their lives. So when we had to negotiate criminal justice reform or transportation or foster care improvements, the leaders of our state didn’t shut down. We came together and we kept our word. Children deserve an excellent education from cradle to career. We owe them safe schools and the highest standards, regardless of ZIP code. Yet this White House responds timidly, while first graders practice active shooter drills and the price of higher education grows ever steeper. From now on, our leaders must be willing to tackle gun safety measures and face the crippling effect of educational loans. To support educators and invest what is necessary to unleash the power of America’s greatest minds. In Georgia and around the country, people are striving for a middle class where a salary truly equals economic security. But instead, families’ hopes are being crushed by Republican leadership that ignores real life or just doesn’t understand it. Under the current administration, far too many hard-working Americans are falling behind, living paycheck to paycheck, most without labor unions to protect them from even worse harm. The Republican tax bill rigged the system against working people. Rather than bringing back jobs, plants are closing, layoffs are looming, and wages struggle to keep pace with the actual cost of living. We owe more to the millions of everyday folks who keep our economy running, like truck drivers forced to buy their own rigs, farmers caught in a trade war, small business owners in search of capital and domestic workers serving without labor protections. Women and men who could thrive if only they had the support and freedom to do so. We know bipartisanship could craft a 21st century immigration plan, but this administration chooses to cage children and tear families apart. Compassionate treatment at the border is not the same as open borders. President Reagan understood this. President Obama understood this. Americans understand this and the Democrats stand ready to effectively secure our ports and borders. But we must all embrace that from agriculture to health care to entrepreneurship, America is made stronger by the presence of immigrants, not walls. And rather than suing to dismantle the affordable care act as Republican attorneys general have, our leaders must protect the progress we’ve made and commit to expanding health care and lowering cost for everyone. My father has battled prostate cancer for years. To help cover the cost, I found myself sinking deeper into debt, because while you can defer some payments, you can’t defer cancer treatment. In this great nation, Americans are skipping blood pressure pills, forced to choose between buying medicine or paying rent. Maternal mortality rates show that mothers, especially black mothers, risk death to give birth and in 14 states, including my home state, where a majority want it, our leaders refuse to expand Medicaid, which could save rural hospitals, save economies, and save lives. Let’s be clear. Voter suppression is real. From making it harder to register and stay on the rolls, to moving and closing polling places to rejecting lawful ballots, we can no longer ignore these threats to democracy. While I acknowledge the results of the 2018 election here in Georgia, I did not and we cannot accept efforts to undermine our right to vote. That’s why I started a nonpartisan organization called Fair Fight to advocate for voting rights. This is the next battle for our democracy, one where all eligible citizens can have their say about the vision we want for our country. We must reject the cynicism that says allowing every eligible vote to be cast and counted is a power grab. Americans understand that these are the values that our brave men and women in uniform and our veterans risk their lives to defend. The foundation of our moral leadership around the globe is free and fair elections, where voters pick their leaders, not where politicians pick their voters. In this time of division and crisis, we must come together and stand for and with one another. America has stumbled time and again on its quest towards justice and equality. But with each generation, we have revisited our fundamental truths, and where we falter, we make amends. We fought Jim Crow with the Civil Rights Act and the Voting Rights Act. Yet we continue to confront racism from our past and in our present, which is why we must hold everyone from the highest offices to our own families accountable for racist words and deeds and call racism what it is, wrong. America achieved a measure of reproductive justice in Roe v. Wade, but we must never forget, it is immoral to allow politicians to harm women and families, to advance a political agenda. We affirmed marriage equality, and yet the LGBTQ community remains under attack. So even as I am very disappointed by the president’s approach to our problems, I still don’t want him to fail. But we need him to tell the truth and to respect his duties and respect the extraordinary diversity that defines America. Our progress has always been found in the refuge, in the basic instinct of the American experiment, to do right by our people. And with a renewed commitment to social and economic justice, we will create a stronger America together. Because America wins by fighting for our shared values against all enemies, foreign and domestic. That is who we are, and when we do so, never wavering, the state of our union will always be strong.